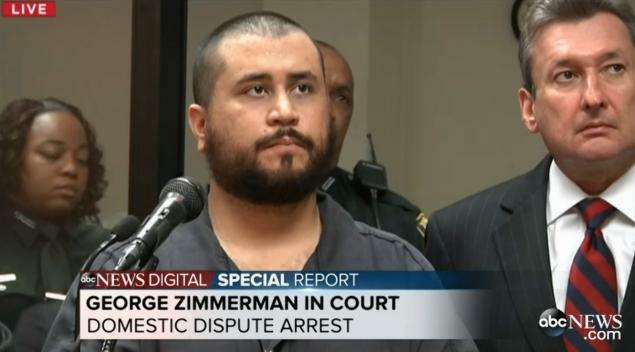 George Zimmerman’s bail has been set at $9,000 after being charged with aggravated assault with a weapon and battery. He was accused in court of choking girlfriend Samantha Scheibe and threatening suicide. George Zimmerman, who was arrested a day earlier on a felony assault charge for allegedly threatening his girlfriend with a gun, was released on $9,000 bond with an order to stay away from the woman and firearms. The former neighborhood watch volunteer, who was acquitted in the shooting of unarmed teen Trayvon Martin, was released Tuesday after posting bail. While being locked up for two days meant his estranged wife Shellie Zimmerman, who had her own domestic dispute with him in September, was able to have him served with a divorce petition, his lawyers confirmed. His lawyers said that while George Zimmerman was stressed, he did not appear suicidal. “I don’t think he’s going to hurt himself or anyone else,” said Daniel Megaro, one of two public defenders appointed by the court to represent George Zimmerman after he declared he is indigent with $2.5 million debts. Questions about George Zimmerman’s state of mind arose during his initial court appearance on the charges stemming from Monday’s dustup with girlfriend Samantha Scheibe at her home in Apopka, Florida. In requesting $50,000 bond, the prosecutor said Samantha Scheibe had told authorities about an incident a week and a half earlier – “a choking that she did not report to the police”. Samantha Scheibe also claimed that George Zimmerman had “mentioned suicide in the recent past” during a breakup talk, telling her that he had “nothing to lose,” the prosecutor said. “She is in fear for her safety,” the prosecutor said as George Zimmerman, wearing a jail jumpsuit and handcuffs, listened quietly. George Zimmerman is not facing any criminal charges from the alleged choking incident. Outside court, Daniel Megaro and the other defense lawyer, Jeff Dowdy, said they only learned of the choking allegation in court and had not spoken to their client about it. They predicted that George Zimmerman would be cleared of wrongdoing in Monday’s clash. The judge found probable cause for his arrest on charges of felony aggravated assault, misdemeanor battery and misdemeanor criminal mischief. George Zimmerman was barred him from having weapons, and his lawyers said his guns had been confiscated by the sheriff’s department after Monday’s confrontation. Meanwhile, police have released the recordings of 911 calls that Samantha Scheibe and George Zimmerman separately made during the argument. When asked what kind of weapon her boyfriend displayed, Samantha Scheibe said it was a “shotgun,” adding that “he has all of his guns inside, both the shotgun and his AR” as well as “two handguns”. He also denied brandishing any weapon at his girlfriend. Police later said Samantha Scheibe declared she is not pregnant. No one was hurt during the incident, police said.